Being part of a well-organized farmer group can be vitally important for small-scale farmers. 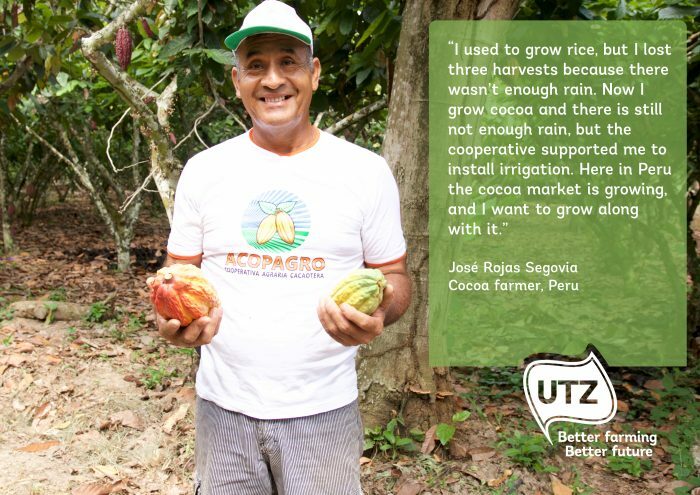 We visited ACOPAGRO, a cocoa cooperative in Peru, to find out why this is the case. 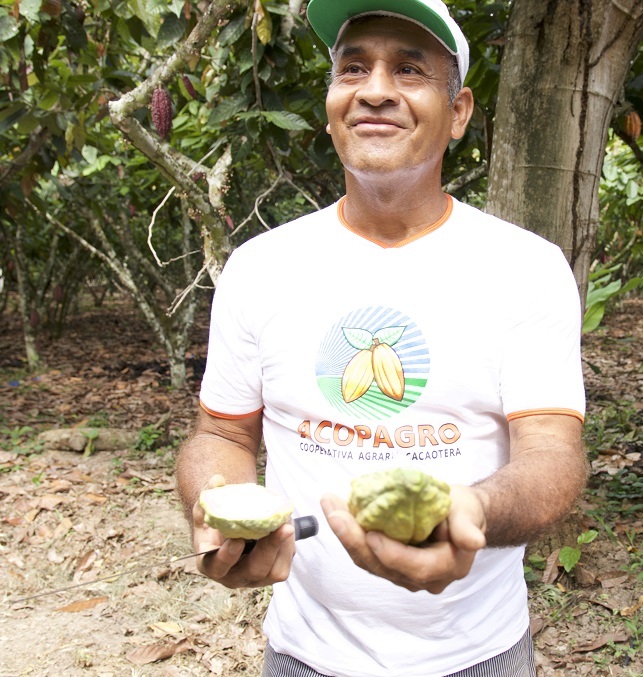 The ACOPAGRO coop was founded in 1998, and now has 1,800 members. All members farm organically, and 1,000 are currently UTZ certified. Bruno has been working here since 2010. ACOPAGRO operates a ‘choba choba’ system, which means ‘today I work for you, tomorrow you work for me’. Farmers trained in good agricultural practices work for each other, to address a lack of available local labor. Swapping labor in this way saves on the need for upfront investment, and creates a shared sense of ownership. The cooperative also arranges training for farmers and makes connections within the community. For example, rice and papaya are other common crops grown in the local area, but they are often not very well managed. Rice and papaya farmers tend to use too many pesticides and implement too little environmental protection on these crops, leading to polluted soil and water. ACOPAGRO uses the example of the rice and papaya farms to show cocoa farmers what happens if they don’t manage their farm well. This is especially timely in light of increasing problems caused by climate change. The cooperative is able to guide farmers on picking the best varieties of crops to grow, as well as effective use of shade trees and irrigation. While certification means an initial amount of work for farmers to meet the necessary requirements, once they reach this stage there are big benefits. With training and access to the tools and resources they need, cooperatives provide a thorough support mechanism for change. Implementing a sustainability standard is not easy. It requires time, money and commitment to make a farm sustainable. 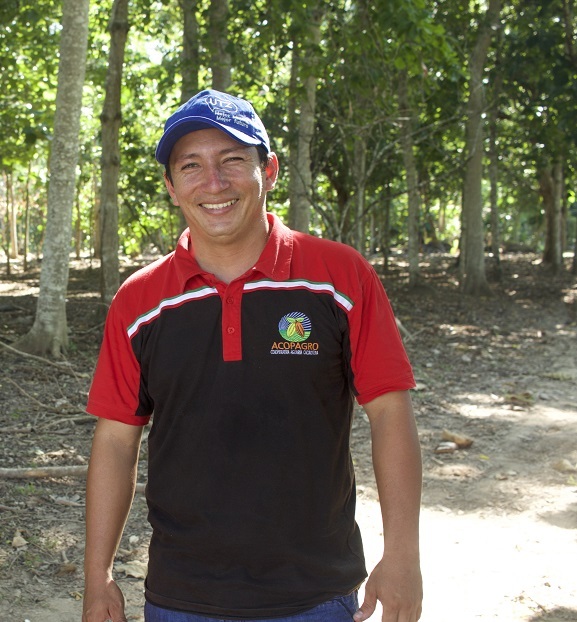 But here at our cooperative the farmers can see the impact of certification. They see their farms improving and their incomes going up. The cooperative is organized into committees, each one with its own network of trainers, promoters and farmers. Technical assistants also work with farmers to help them implement changes. Part of the technical assistants’ role is to gather information about the farmers, for instance using GPS to check the land area of individual farms, estimating yields and keeping digital records. All this makes it easier for the cooperative to see how different farmers are doing, so they can see where improvements can be made, and target resources and training appropriately. Curious to see all testimonials of Bruno and José and use them in your own communications? Download them here. How to train 10,000 farmers in one year. A field example.